This entry was posted in Encouragement, Kindness and tagged Appreciation, Compassion, Encouragement, Generosity, Happiness, Inspiration, Kindness, Life, Love, Loving kindness, Spirituality. Bookmark the permalink. Pingback: Nurturing Thursday – Only for You | "On Dragonfly Wings with Buttercup Tea"
Absolutely nothing!!!! — especially wonderful when least expected!! …and a beautiful basket it is! Hi Cat….I’m at an amazing 5 day retreat/workshop about nurturing and sharing kindness with others, in whatever ways work for each of us. So many blogs share kindness…perhaps wander into a few of those to help replenish yourself? ?….you’re adjusting to a lot…so please be sure to try to offer kindness and nurturing to yourself…. And….perhaps do an imaginary dive into that basket of kindness up above???? 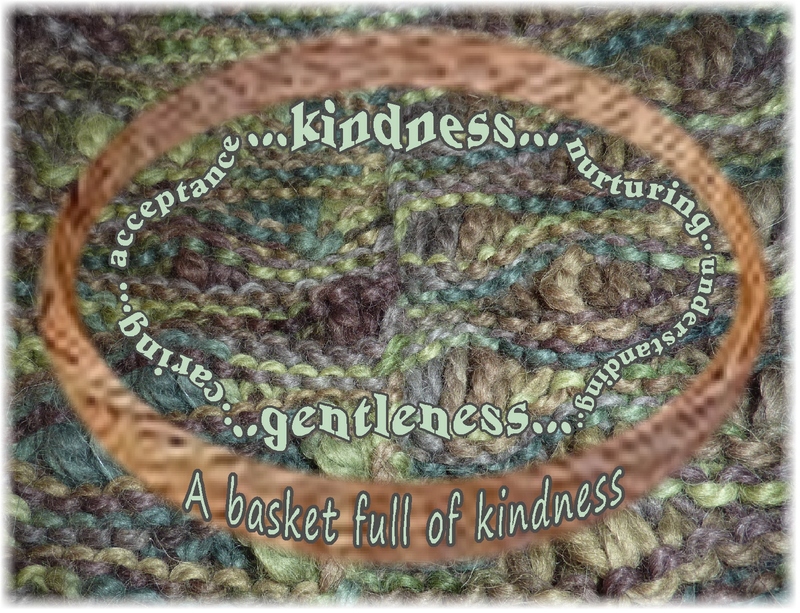 The basket of kindness evokes feelings of warmth. This world would change if everyone extended a little bit of kindness to one another. Read the comments, and, yes kindness to self is important. Sometimes we can forget to do this. How cool you are in a kindness retreat. It’s a wonderful way of nurturing your mind, heart and soul. I’m back from the 5 days… days that were completely filled, to overflowing, with kindness, encouragement and dozens of great suggestions and ideas… little did I realize that the words/qualities on that basket would come true…wow!…nice surprise! Pingback: Nurturing Thursday – Isn’t it Time? | "On Dragonfly Wings with Buttercup Tea"